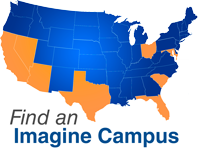 The Middle and Prep Schools on this campus are owned and operated by a subsidiary or affiliate, as the case may be, of Imagine Schools Non-Profit, Inc. The Prep school on this campus is owned and operated by a subsidiary or affiliate, as the case may be, of Imagine Schools Non-Profit, Inc. The elementary and middle school are owned and operated by a subsidiary or affiliate, as the case may be, of Imagine Schools Non-Profit, Inc. The middle school on this campus is owned and operated by a subsidiary or affiliate, as the case may be, of Imagine Schools Non-Profit, Inc.